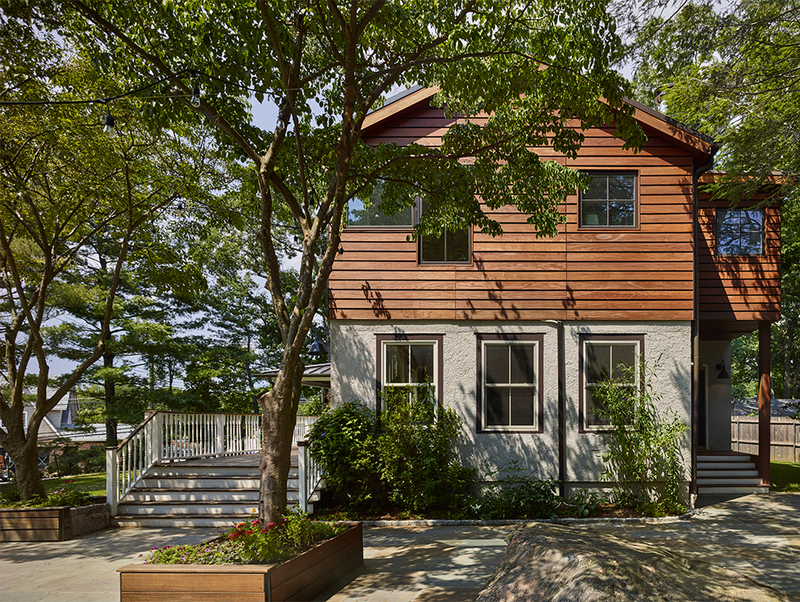 While Murdock Solon Architects is often updating NYC brownstones or building ground-up modern houses, it welcomed the opportunity to also work with a home originally built in 1861 in Rye, New York. We were tasked with enlarging the existing home’s structure, as well as providing a detached pool house that would also serve as a year-round family room, complete with a projection screen and kitchenette. For the main house, we developed an efficient addition that was sensitive to the stucco-clad 19th-century farmhouse while still accommodating the aesthetics of the owners’ sophisticated sensibilities and the needs of the family of seven. The wide-planked pine floors of the original house were extended into this addition, which found its form in a large open-plan kitchen and living room. A pantry added off the main kitchen hides smaller appliances and includes a water fountain, ice machine, and snacks for easy accessibility for the couple’s five young children. A new entry opposite the kitchen introduced a much-needed mudroom where a new staircase comprised of both reclaimed wood and stainless steel cables is emblematic of the desire to mix the new and old in an understated way throughout the project. This stair leads to the new addition’s second floor, connecting it to the existing house by way of a link. We used the link as an opportunity to provide additional functionality, creating a playroom and reading area overlooked by a play loft that was originally unfinished attic space. On the exterior, we chose to introduce a completely new finish rather than matching the original stucco exterior. A slatted ipe rain screen helps define the old from new. Ipe is an extremely durable hardwood that, over time, will acquire a silvered patina to compliment the gray stucco. The two materials punctuate the natural beauty of the tree-covered site through the introduction of different visual textures and colors, creating a natural collage that works seamlessly with the indigenous plants and trees on the property.